AppML combines the most up-to-date techniques and ideas of modern web development. The Model describes your application. The View displays your data. The Controller controls your application (of course). The model describes the application. The model is reusable on different hardware and software platforms (Server, PC, iPhone, Tablets, etc.). The model is not concerned with presentation or user interface (UI). The view is the UI (User Interface) for displaying (and input) data. AppML can display data as defined by HTML attributes. Keeping application size and complexity low, is the main problem of all programming. Controlling computer application complexity, is the true art of programming. Software development often breaks deadlines and budgets. Finished software is often full of coding errors. This is because computer code is difficult to develop, test, and maintain. Coding is Out. You should describe more What to do, less How to do it. 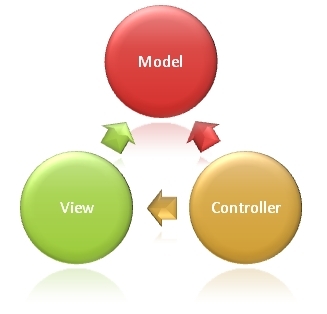 With AppML you Declare your application in the Model and in the View. With AppML there is less (sometimes nothing) to code. Controlling computer application complexity is the true art of programming. Keeping application size and complexity under under control is the main problem of all programming. RAD is a software development method that uses minimal planning in favor of rapid prototyping. AppML delivers super-fast prototyping, up to 100 times faster than traditional development methods. Application prototypes can run directly from the application model, without any coding. Agile software development is a method based on step-by-step development, where solutions are created by users and developers in collaboration. With AppML, applications can be written step by step, in small increments, from prototypes to full applications. 1. Code First: Using pre-programmed, pre-tested code, adding only new application descriptions. 2. Contract First: Coding the application from scratch using the full application requirement description. AppML uses the most rational concept: Code First. Service Oriented Architecture (SOA) is an architecture for building web applications. SOA offers low development costs and high flexibility. With SOA, applications can be created from scratch, or from existing IT infrastructures, and be used, by different applications, on different hardware and software. SOA is a perfect fit for MVC and Declarative Programming, where data can be easily consumed without the concern about how. A Web Service is an interface to data, identified by a URL, just like a web page. A Web Service differs from a web page, only in the way it communicates information. A typical Web Service only provides data to a web page. With AppML, HTML is the user interface, a Web Service provides the data. Original Web Services were designed to use XML standards like SOAP, WSDL, and UDDI. Modern Web Services like AppML are much easier to use. Example: A small program designed to supply other applications with the stock exchange prices. Example: Flight schedules and ticket reservation systems. Since web services use HTTP, they are independent of both operating systems and programming languages. Cloud Computing is an extension of SOA: Application-as-a service, Storage-as-a-service, Data-as-a-service. With AppML, it is very easy to put both databases and applications in the cloud.